Bypass Isolation Automatic Transfer Switches (ATS) are rated for applications ranging from 800 to 4000 Amps, up to 600 Vac with interrupting ratings of 65kAIC@480Vac thru 150kAIC@480Vac available. The Standard Bypass Isolation ATS utilizes separate, internal spring charging motors, open coils and close coils, to operate both the normal and emergency insulated case units. Normally, the transfer switch operates on the preferred power source with the Normal insulated case unit in the closed position and the Emergency insulated case unit in the open position. 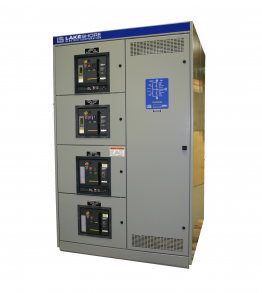 The Standard BP ATS provides dependable, positive, programmed delay transfer to an emergency power source in the event of normal power source failure. The switch returns the system to the normal power source in an orderly fashion when normal power is restored. In the event that the emergency source fails, the switch will automatically return to the normal source when it becomes available. All ATS are protected by mechanical interlocking located to the right of the insulated case units to prevent accidental paralleling of the sources except were temporary source paralleling is required. They are a Dead Front design with rear access for operator safety. They are equipped with manual charging handles, manually operated mechanical open/close pushbuttons and open/closed mechanical position indicators to safely operate the transfer switch manually. The main design difference of these units compared to the standard IC ATS are the four (4) insulated case units used in the BP ATS design. These insulated case units may all be draw-out style, or a mix of draw-out and fixed styles. The bypass insulated case units are for manual operation during servicing of the main insulated case units that are operated by the ATS controls. This allows the main unit to be serviced without removing desired power from the load. These BP ATS must be manually operated during service periods. Bypass Isolation Automatic Transfer Switch manual is currently under review. Please contact us by phone at 800 225-0141 or by email here.